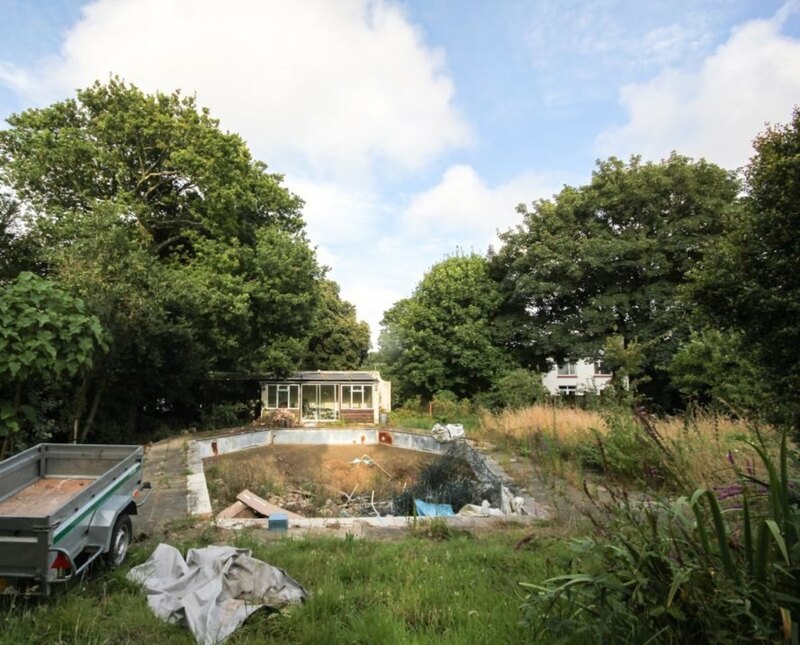 When DLM Architects was asked to create an energy-efficient and sustainable family home in St Peter Port of Guernsey, the site’s dense vegetation proved both a boon and a challenge. 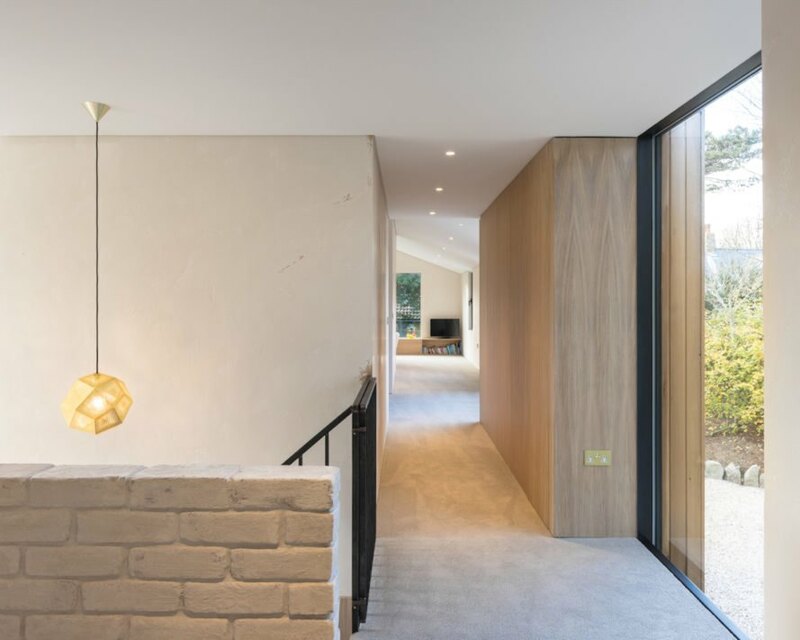 The local planning department had imposed many site restrictions due to the number of protected trees, but after four years of negotiation the architects developed a beautiful and light-filled dwelling with a sensitive environmental footprint. Named ‘The Glade’ after the its location in a clearing surrounded by forest, the new-build family home occupies a spacious 3,230 square feet of living space spread out across two floors in a roughly L-shaped plan. To preserve privacy and views from and to neighboring properties, the home is partly sunken into the site’s natural topography with the basement set into an existing swimming pool excavation from the previous build. Guernsey granite and reclaimed brick, mostly sourced on site, clad the ground floor. Cladding is split on the upper floor, with the eastern side featuring a steel-framed cantilever covered in a living wall of 4,000 plants of 13 native species to camouflage the building into the tree canopy. The living wall also doubles as an extra layer of insulation while providing a buffer from acoustic and air pollution from the nearby roads. A double-glazed link housing the staircase separates the plant-covered east wing from the west end where the second level is clad in cedar. 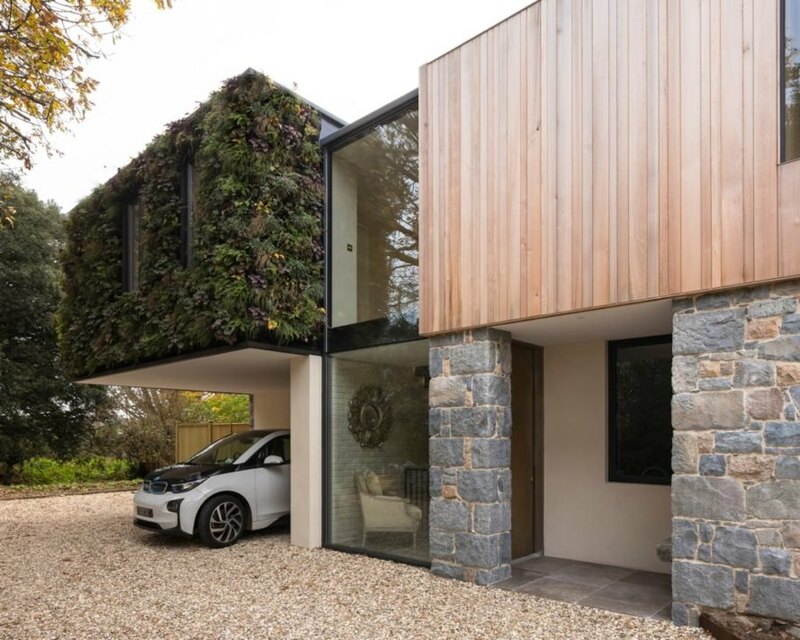 When DLM Architects was asked to create an energy-efficient and sustainable family home in St Peter Port of Guernsey, the site’s densely planted vegetation proved both a boon and a challenge. 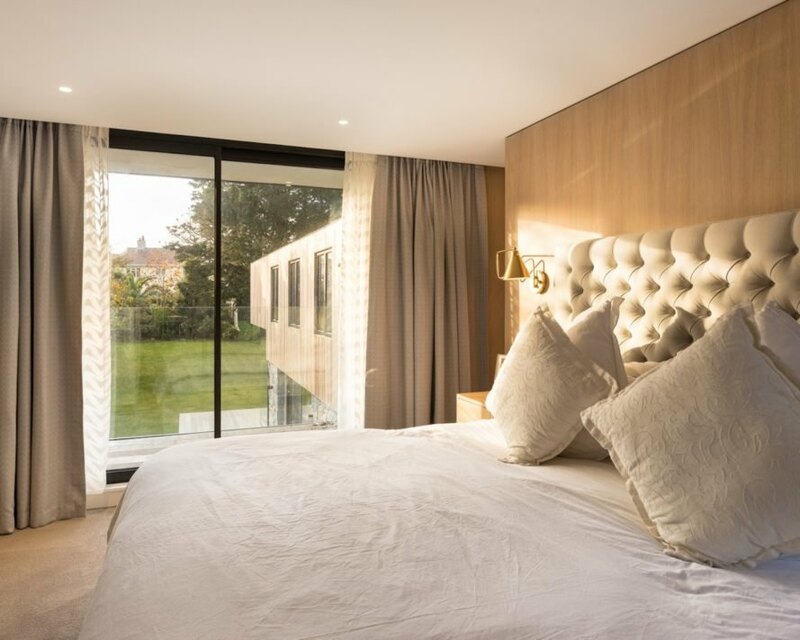 The local planning department had imposed many site restrictions due to the number of protected trees, but after four years of negotiation the architects managed to settle on a solution resulting in a beautiful and light-filled dwelling with a sensitive environmental footprint. Named ‘The Glade’ after the its location in a clearing surrounded by forest, the new-build family home occupies a spacious 3,230 square feet of living space spread out across two floors in a roughly L-shaped plan. To preserve privacy and views from and to neighboring properties, the home is partly sunken into the site’s natural topography with the basement set into an existing swimming pool excavation from the previous build. Guernsey granite and reclaimed brick, mostly sourced on site, clad the ground floor. Cladding is split on the upper floor, with the eastern side featuring a steel-framed cantilever covered in a living wall of 4,000 plants of 13 native species to camouflage the building into the tree canopy. The living wall also doubles as an extra layer of insulation while providing a buffer from acoustic and air pollution from the nearby roads. A double-glazed link housing the staircase separates the plant-covered east wing from the west end where the second level is clad in cedar. 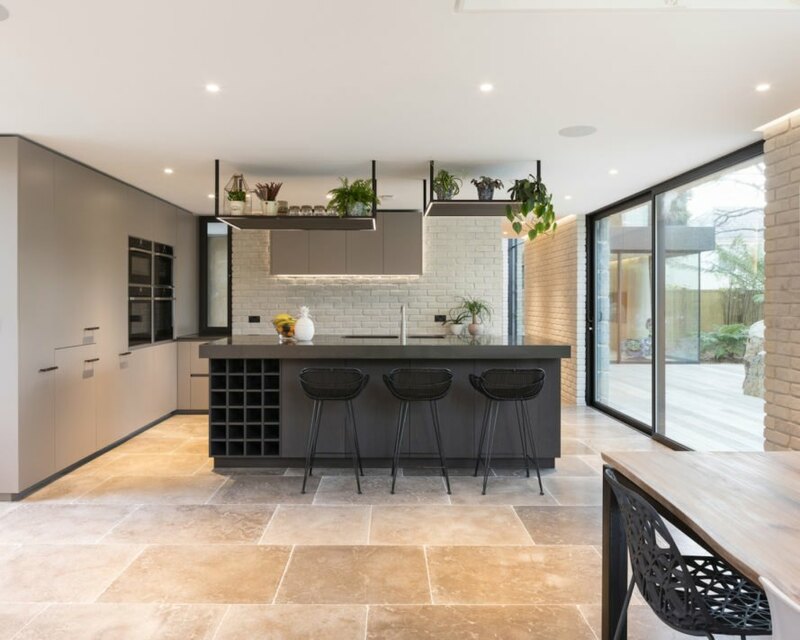 Open-plan living is prioritized throughout the home, as is ample glazing to maintain a fluid connection with the outdoors. A natural materials palette is also used throughout the interior.